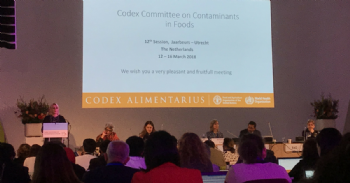 The Scientific Coordinator of the OIV, Jean-Claude Ruf, participated in the 12th session of the Codex Committee on Contaminants in Foods (CCCF), which was held on 12-16 March 2018 in Utrecht, the Netherlands. Among the items on the agenda for this session, the delegations from Member States present discussed the revision of the maximum limits on lead in food, including those for wine. Within this framework, the working group established in 2017 recommended reducing the maximum limit in the current Codex from 0.20 mg/kg to 0.05 mg/kg. Several delegations remarked that the data considered by the electronic working group comprises data on beverages other than grape wines. For the setting of maximum limits, it would also be appropriate to take into account the specific characteristics of certain types of wines, such as fortified wines. The representative of the OIV indicated that the International Organisation of Vine and Wine has adopted various recommendations on lead in wines over many years; in 1996 in particular, the OIV set a maximum limit at 0.20 mg/L, which was approved by the Codex in 2001. In 2006, the OIV established a new maximum limit of 0.15 mg/L, which is still in effect today. The OIV drew the attention of the CCCF to the fact that an overly low limit, based only upon a statistical analysis of the samples and not specifically justified from a strictly health-related point of view, could have significant consequences on international trade. On the basis of data from the working group, a maximum limit of 0.05 mg/kg would eliminate around 3% of wines (7.5 million hectolitres of wine), which would be excluded from the international wine trade, as well as a large proportion of fortified wines (24%). In addition, Jean-Claude Ruf also indicated that the OIV is continuing to work on this issue and, in particular, has already initiated a discussion on the potential reduction of the current limit (0.15 mg/L). The Scientific Coordinator encouraged the CCCF to take into account the new work of the OIV on this issue, in order to avoid any duplication or inconsistency with respect to potential limits in the future. After discussion, and after taking into account all of the information – in particular that which was mentioned by the OIV – the CCCF, at the proposal of its President, decided to postpone discussion of the maximum limit on lead in wine for the coming year. The working group presided by the United States was renewed with this objective of focusing on evaluating the specific characteristics of fortified wines. Moreover, the Committee also agreed to launch new work on the revision of the Code of Practice for the Prevention and Reduction of Lead Contamination in Foods (CAC / RCP 56-2004), adopted by the Codex in 2004, in order to incorporate means of reducing the lead content in wines. Furthermore, the CCCF agreed to present a reduction in the maximum limit on lead in grape juices from 0.05 mg/kg to 0.04 mg/kg to the Codex Committee for final adoption.